Did Trumpeter Swans Ever Breed in Eastern North America? The authors of this web site, Bill Whan and Gerry Rising, yield to no one in our admiration for trumpeter swans, uniquely beautiful and imposing members of our North American avifauna. We mourn their passing in so many parts of their former range, and we support their restoration within that range where that can be accomplished without endangering other species. We also honor the biologists, wildlife managers, and other advocates who have undertaken the responsible fostering of restored swan populations in that region of Central and Western North America. All the same, the trumpeter swan has never deserved -- nor has it received -- a designation as an endangered, or even a threatened, bird in North America. It is true that its Lower 48 populations numbered in the dozens fifty years ago, but it was never numerous south of Canada, and healthy populations in the thousands have for centuries persisted in western Canada and Alaska. Our admiration and advocacy for these beautiful creatures does not extend, however, to some of the excesses of certain swan enthusiasts. They have chosen to assert, on the basis of unsatisfactory evidence, that trumpeters once bred and wintered far and wide across eastern North America. They have persuaded some state and provincial wildlife agencies to undertake expensive and demonstrably unsuccessful "restorations" of trumpeter swans in areas where they have no claim to native status. They have influenced a few scholars to undertake radical re-drawings of the species' range map, to produce a range far in excess of that accepted by generations of scholars. They have attempted to manipulate the public's esteem and sympathy for this charismatic species to justify its introduction into habitats where it has no place, and where it may in fact constitute a threat to the native ecosystem. We oppose this re-conceptualization of the trumpeter swan's range, both on behalf of the swans themselves and on behalf of other species in the habitats into which they might be introduced. It turns out that the issue we raise about the trumpeter swan's historical range is an important one. The orthographic difference between introductions and reintroductions may only be two letters, but the conceptual difference is great. You need only read the differing concerns raised in the International Union for the Conservation of Nature and Natural Resources Position Statement on Translocation of Living Organisms to see how important is this consideration. (At this site compare the requirements for re-stocking and re-introductions with those for introductions.) Clearly the requirements for reestablishing the population of an extirpated species are far less than those for introducing an alien species new to a region. We have argued our concerns about introductions in Eastern North America with a director of the Trumpeter Swan Society as a "point/counterpoint" debate in the pages of Birding magazine. To see both sides of this important issue follow this link. Our position is described in greater detail in the following sections. It should be recognized at the outset that in justifying our claim that trumpeter swans never bred in Eastern North America we face a logical difficulty. It is obviously impossible to prove that an activity such as breeding did not occur in a region. One friend has even suggested that the trumpeter swan might have bred in the east, as he puts it, "before the Ice Age, their bones have been lost and therefore we cannot say that this region is outside their breeding area." (Of course, the problem inherent in that line of reasoning is that it would prevent our delineating historical breeding ranges for any species. We might then claim justification for the re-introduction of ostriches to New England.) What we seek to establish then is something less than logical proof, but something that we believe should be acceptable to those who examine the evidence we are gathering. We propose to show that acceptable evidence for this swan species breeding in Eastern North America does not exist and that, rather, the available evidence points to their not breeding here. 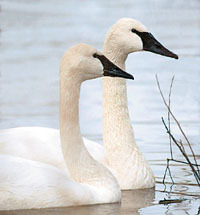 Specifically, we have set out to establish that Trumpeter Swans did not breed in Eastern North America, that is in Ohio, Pennsylvania, New York, the New England States and states to the south of them nor in southeastern Ontario, Quebec (except near the shores of James and Hudson Bays) and the Maritime Provinces. By southeastern Ontario we mean the part of that province to the east and south of Georgian Bay. This is the region of Canada and United States east of the gray-stippled breeding range shown on this first map. A major concern for everyone interested in this problem is the fact that those with whom we differ have managed to redefine the range according to their own interests. Consider in this regard two maps of North America displaying the range of trumpeter swans. The first is taken from Frank C. Bellrose, Ducks, Geese and Swans of North America (Harrisburg, PA: Stackpole Books, 1976) p. 89. 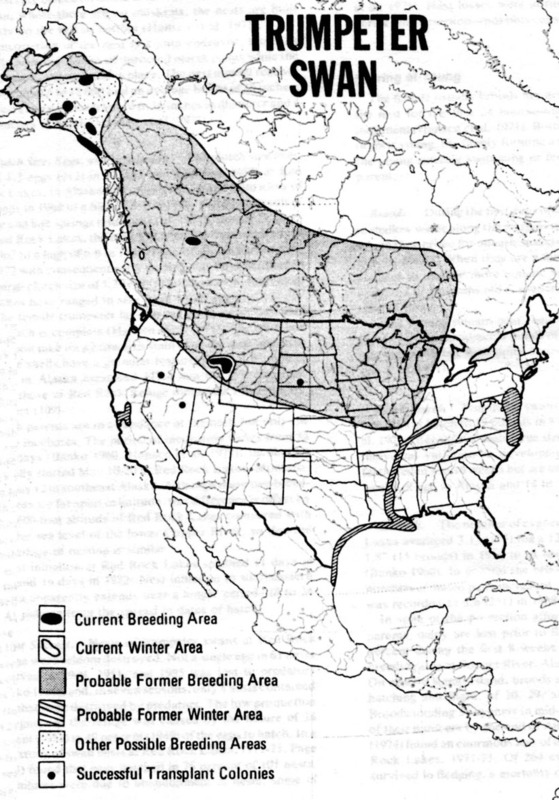 Although derived independently, it virtually coincides with the map based on information summarized by Ralph S. Palmer and Winston E. Banko on page 61 of Palmer's Handbook of North American Birds, Volume 2 (New Haven, CT: Yale University Press, 1976). The difference between these two maps should be evident to anyone examining them. Unfortunately now all those who wish to establish a trumpeter swan population in the East base their ideas on this map and others like it. 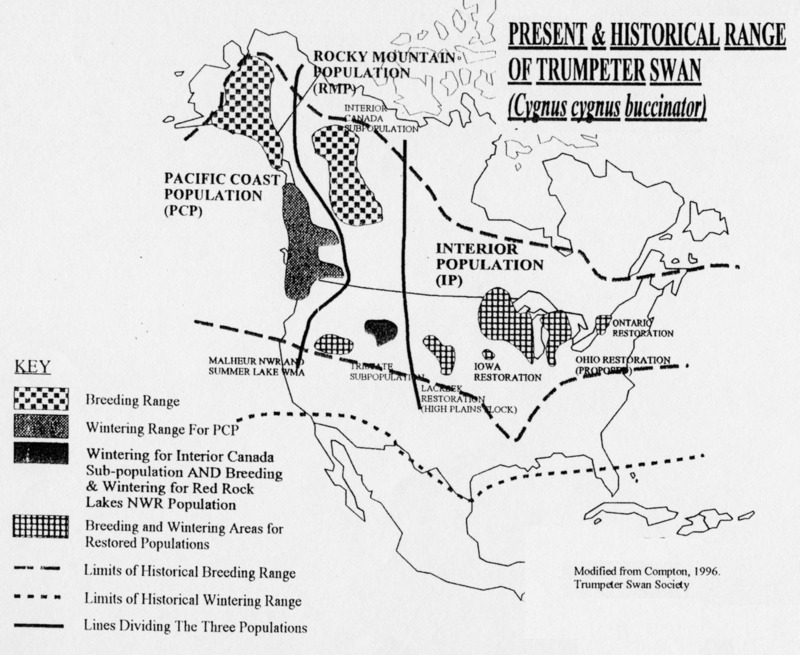 For example, a map similar to this has been displayed on the Trumpeter Swan Society website. Of even greater significance is the fact that widely recognized documents accept this range extension. The best example of this is Carl D. Mitchell's 1994 Life History No. 105 "Trumpeter Swan" in Birds of North America (Philadelphia, PA: The Academy of Natural Sciences of Philadelphia). Mr. Mitchell is a former board member of the Trumpeter Swan Society. He extends the trumpeter's historical breeding range to "Ontario, Quebec, east to Nova Scotia, New Brunswick, and Newfoundland" citing publications by Lumsden (another society board member) and Alison, despite the latter's direct contradiction. In the paper Mitchell cites Alison states: "There is no material evidence that trumpeters have bred anywhere in Ontario." We believe that this vast range extension encompassing hundreds of thousands of square miles is unwarranted. Still we would be little concerned if this were the historical range of, say, the pine siskin. The effect of such an error would be negligible. But the trumpeter swan is one of our largest North American birds and the impact of this alien species on our already severely reduced eastern marshes would, as we have pointed out in our paper in Birding magazine, be very serious. It is for that reason that we are carrying out this research. First, we are reevaluating the evidence on which the claims of this range extension are based. As you might expect, we have found this evidence unsatisfactory. Some of our progress on this task may be found in the associated file entitled Refutations. Second, we are examining primary sources such as the diaries of early explorers and traders to find reference to or the absence of reference to breeding swans. So far the dozens of sources that we have investigated, some of which speak extensively of other species, do not record breeding swans in the east despite the fact that swans are easily recognizable. This compares in striking fashion with the hundreds of trumpeter swans within the established breeding range in the west that were collected by Hudson Bay Company posts or were recorded by explorers like Lewis and Clark. The few acceptable records of trumpeter swans in the east are observations of birds during their natural spring and fall migration seasons or during winter. Most of these records represent swans following their former natural flyway which led from their western breeding grounds southeast to wintering areas along the Atlantic coast of Virginia and North Carolina (see the Bellrose map), the few records from New England representing strays blown off course by stronger than usual gusts from our prevailing westerly winds. The tundra swan (formerly the whistling swan), a species not easy to differentiate from the trumpeter swan in the field, especially when the two are not seen together for comparison, was and still is the common swan of the eastern United States. (Some have argued that the mute swan was here as well but we remain among those who believe that it was introduced later.) Few early explorers who reported swans differentiated between trumpeter swans and tundra swans (Lewis and Clark were a notable exception) so swan reports were most often reports of tundra swans. While the breeding range of this species is now in the very far north, it is as easy to argue that their breeding range extended farther south as it is that the trumpeter swan's range extended farther east. Based on what we have found so far and the scientific principle of parsimony, we remain convinced that the trumpeter swan's historical breeding range did not extended east of Michigan, western Ontario and the eastern shores of Hudson's and James Bay. Bill Whan, Did Trumpeter Swans ever breed in Ohio?, a February 2007 revision of his paper that appeared in The Ohio Cardinal 24: (1, Autumn 2000): 30-46. Bill Whan, Literature Cited in the Paper: "Did Trumpeter Swans ever breed in Ohio?" Gerry Rising, The Questionable Wisdom of Introducing Alien Species The Kingbird 51 (2, 2001): 575-578. This web page is about the historic breeding grounds of trumpeter swans but we feel that it is important to include a brief comment about an argument used by those who wish to bring trumpeter swans to the East. We join the Fish & Wildlife Service personnel who consider the mute swan an increasingly serious pest species. For an excellent source of information on this problem, see the Patuxent Wildlife Research Center posting on this matter. Mute swans are aggressive birds that kill or drive away from their territories other waterfowl. In marshes that they inhabit they soon become not only the dominant waterfowl species but too soon the only species. At the same time their feeding habits are very destructive of habitat. Unfortunately, in its "wisdom" the U.S. Court of Appeals for the District of Columbia has recently exacerbated this problem by adding protection of this alien Mute Swan under the Migratory Bird Treaty Act. Visit this site for the text of this strange decision. To respond to this severe problem, the trumpeter swan is being offered as a solution. It will displace the mute swan, the argument goes. In support of this, evidence is offered that trumpeter swans do indeed drive mute swans away from their territory. There are, of course, difficulties with the logic of this "solution." The trumpeter swan, a still larger bird, is even more destructive of habitat. And evidence has been presented that they too can be aggressive birds. No one claims that they encourage mute swans to move away by peaceful negotiation. And that they are sometimes aggressive toward other wildlife is established in a paper by Lawrence N. Gillette, "The Impact of Nesting Trumpeter Swans on Other Species of Waterfowl," Proceedings and Papers of the Eleventh Trumpeter Swan Society Conference (1988) pp. 162-163. And suppose we accept the idea that a pair of trumpeter swans will drive a pair of mute swans out of the marsh in which they seek to breed. Surely the mute swan would simply take up residence in another nearby marsh, this inevitable process leaving us with two wetlands being destroyed. Where then is the gain in this proposed strategy? "In the category of what we might call Big Bad Ducks, Canada Geese continued to obliterate any memory of the concept that they used to be considered symbols of wilderness. As a case in point, consider Phelps Pond, monitored by William Reid in northeastern Pennsylvania. The pond 'now has seven pairs of Canadas and no more Moorhens, Soras, or Least Bitterns.' Similar horror stories have cropped up countless times in recent years, as the wild goose has become a golf course goose and city park goose and suburban goose, overrunning many wetlands that once held a wider variety of species. Many of the most problematic populations in the lower 48 states were actually introduced by state game agencies, who may or may not be alert enough to be having second thoughts about them now. "Then there's the Mute Swan. It's like a Canada Goose in some ways, only a lot bigger, and not even native on this continent. Runaway populations of Mute Swans are trashing our beleaguered coastal marshes from Cape Cod to Chesapeake Bay, and are increasing in parts of the upper Midwest as well. Responsible attempts to control their numbers are often stymied by well-meaning "animal lovers" who seem to value feral swans over native wildlife. (For a good account of the conflict, see the article by Ted Williams in the November-December 1997 issue of Audubon magazine.) This season there was little comment on the ongoing problem on the coast, but Mute Swans were showing up in new places in the interior. A flock wandered through southern Quebec and a few showed up in western Pennsylvania; one that got all the way up to the Ontario coast of Hudson Bay was, as Ron Ridout said, 'astounding and just a little worrisome.' One wonders how far these big birds could ultimately spread. "Okay, class, let's see a show of hands. Considering our experiences with Canada Geese and Mute Swan, how many of you are in favor of taking the Trumpeter Swan--another huge waterfowl species--and introducing it into areas of the upper Midwest and the Atlantic Coast where we think it might have been native once? Areas were wetlands are now severely reduced, where other wetlands species are now struggling to maintain a foothold? Yeah, that's what I thought. Unfortunately, you and I are not in charge of that decision. 'Reintroduction' programs for Trumpeter Swans have been going on for some time now in a number of northern states and provinces, and even as far east as Virginia. "Some of these Trumpeter introductions are doing disquietingly well. In the Twin Cities area of Minnesota, at least twenty pairs nested, probably representing at least a thousand pounds of swans. Others nested in Wisconsin, Iowa, and Ontario. A pair nested for the third year at Perch River Wildlife Management Area in upstate New York. Not introduced locally, this pair probably reflects spillover from Ontario, and their presence (and their potential impact on the marsh) does not bode well for the declining Black Terns at Perch River. A couple of Trumpeters also lingered in Pennsylvania into June. Not mentioned in these pages, but publicized elsewhere by a cheerleading section of uncritical media reporters, was the deliberate attempt to teach more feral Trumpeters in Virginia to migrate a few dozen miles to Chesapeake Bay. "There seems to be a widespread sense that it's fine to introduce a species to a region as long as that species was native there at one time (even if the environment in that region has changed dramatically since). The pro-swan faction would have us believe that Trumpeters were once all over this continent, wintering south to central Florida and north along the Atlantic Coast as far as ice-free waters existed. However, the most authoritative sources on the birds of Florida, Virginia, and Massachusetts, for example, do not mention this species, even as a hypothetical. I regard the former omnipresence of Trumpeters as less than proven. Even if they did once range along the Atlantic Coast, it was in an era when that coast was vastly different than it is today. Trumpeter Swans are doing well in the west, in country where they have enough room; their populations have been increasing there. The inclusion of this species on the Partners in Flight 'Watch List' of birds in potential danger is bizarre, and must have been politically motivated; it would make a better fit on the 'Watch Out List' if we had one! I don't know why there isn't more scrutiny and regulation of schemes to introduce huge, potentially damaging birds like swans into new areas." Given these additional problems, we argue strongly against introduction of this alien species, the trumpeter swan, to the Eastern North America.